For faster service, when contacting us we'll need to know the location of the cleanup site, the name of a contact person or family member and a general description of what happened. Meth-lab testing and site assessment is the first step to determine if a property has been contaminated by "Meth" residues and to what extent. Until "Meth" testing has been performed a cost for a "Cleanup" cannot be determined. 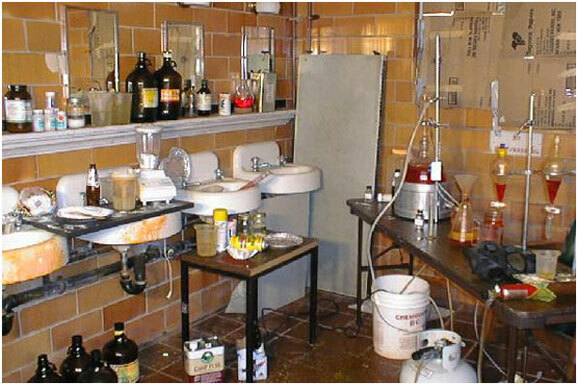 Meth lab testing consists of obtaining physical wipe swab samples from surfaces such as walls and ceilings in a home. The samples are then collected and sent to an outside laboratory for analysis. In about a week results are known and from there we can determine if any the toxicity of the property and at what cost a "Cleanup" will be. We deliver prompt, professional services for many forms of biohazards and tragedies. 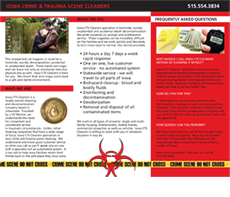 Our goal is to alleviate trauma to victim's families and discreetly restore chaotic properties to normal as quickly as possible. © Copyright 2018 Iowa CTS Cleaners.